Frontside Boardslide - Slide on the center of the board between the trucks facing backwards. ﻿Ollie ﻿and frontside 180 ollie. backside 180 ollie, backside boardslide 50-50 grind. This trick requires an ollie and twisting. There is a large transfer of weight from your wheels to the edge you are sliding. Roll facing the curb at a 45° angle. Place your back foot on the tail and your front foot in front of the hardware partly on the nose. Ollie up over the edge. Use the same positioning you would use for a 50-50. 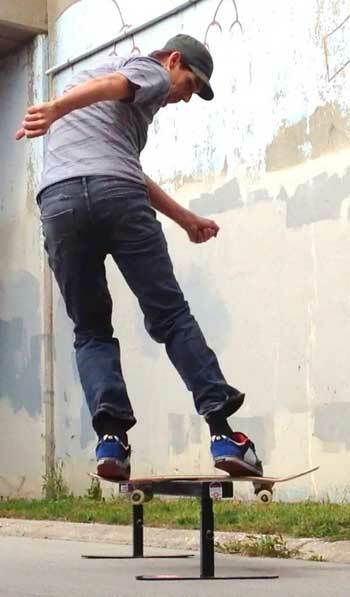 At the peak of the ollie. Twist your lower body to face backwards. Put the nose over the edge and point your foot backwards. Pull you back foot in the direction of travel under you. Twist your upper body forwards. Turn the board perpendicular to the edge. Stay on the middle of the concave on your toes. Too much on to heels and you will grip. Too much on your toes and the board will slide out. Compress your knees to maintain balance. Slide right to the end. Land to roll in a normal position. Keep doing this trick over and over. Try doing it at the end of the edge so you can feel the balance. This will let you get the feel of the lock in and slide. Slide it a short bit and pop off. Get longer and longer. Soon you will be able to lock in and slide long. Front boards are a sick trick.